To donate with your credit card, please select a level from the list below. You can send PayPal payments to: [email protected] At this time we do not accept Bitcoin or other forms of electronic payment. Your $35 pledge to CKUW gets you the illustrious CKUW Friends Card, which gives you insider access to discounts and/or special offers at all of the participating businesses. Your $70 pledge gets you a CKUW Friends Card (which gives you insider access to discounts and/or special offers at all of the participating businesses), plus an exclusive CKUW Fundrive t-shirt. Your $95.90 pledge gets you a CKUW Friends Card (which gives you insider access to discounts and/or special offers at all of the participating businesses) and the 2019 ‘A Night of Country Music’ CD & Download code. This night of live & local country music was produced by Sean Burns! Other options include a CKUW puzzle or a set of CKUW sew on patches. 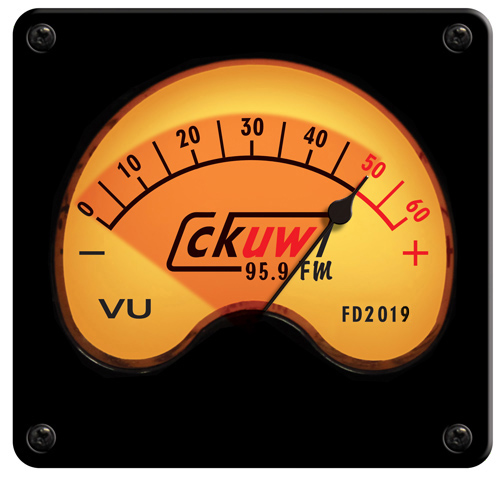 Your $120 pledge gets you a CKUW Friends Card (which gives you insider access to discounts and/or special offers at all of the participating businesses), plus a CKUW Fundrive t-shirt and a choice of either: A 2nd t-shirt, our bluetooth radio, a handmade mug OR a CKUW 95.9 toque! Special at this level and above, you can chose a ‘vintage’ CKUW shirt instead of a second shirt or toque. You can view the gallery of vintage shirts here: Vintage CKUW Shirts Please note that sizes and selection are limited. Your $160 pledge gets you a CKUW Friends Card (which gives you insider access to discounts and/or special offers at all of the participating businesses), a premium CKUW hoodie, PLUS your choice of: A CKUW Fundrive t-shirt, a toque, 2019 CD or 2018 puzzle..
Special at this level and above, you can chose a ‘vintage’ CKUW shirt as one of your options. You can view the gallery of vintage shirts here: Vintage CKUW Shirts Please note that sizes and selection are limited. Your $280 pledge gets you a CKUW Friends Card (which gives you insider access to discounts and/or special offers at all of the participating businesses), TWO CKUW hoodies and TWO CKUW Fundrive t-shirts. Or swap the shirts for other Fundrive goodies. Stand out in the crowd by showing your allegiance to community radio! I want to convey my utmost satisfaction with the programs I listen to on the radio and especially the Thursday program called Global Research hosted by Michael Welch. I enjoy his analysis and line of questioning which helps in the expansion of understanding of the issues being discussed.